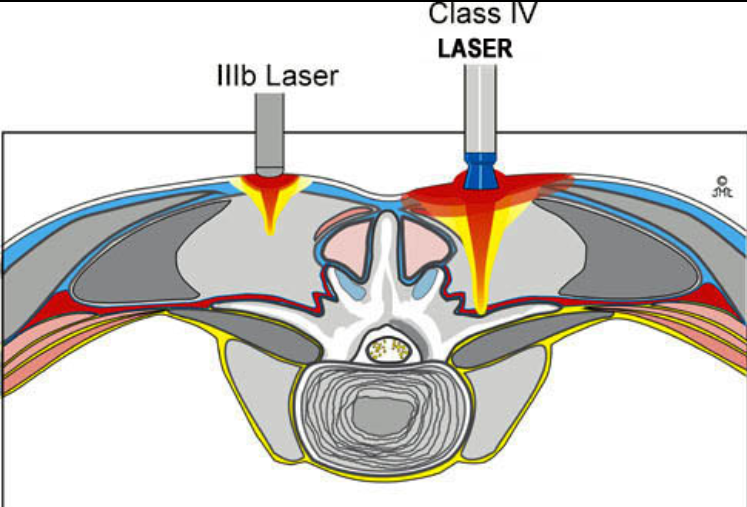 At Vitality Spine & Wellness we use Class IV LASER. In the picture above you can see the difference in penetration of the lumbar spine between a class III and class IV. Cold lasers are handheld devices used by the doctor and are typically the size of a flashlight. The laser is placed directly over the injured area for 30 seconds to several minutes, depending on the size of the area being treated and the dose provided by the cold laser unit. Cold laser therapy is one option among a variety of treatment approaches that can potentially alleviate pain symptoms without the use of surgery or drugs. Call Vitality Spine & Wellness today for a free consultation.